Family portrait, a photo by The Bacher Family on Flickr. 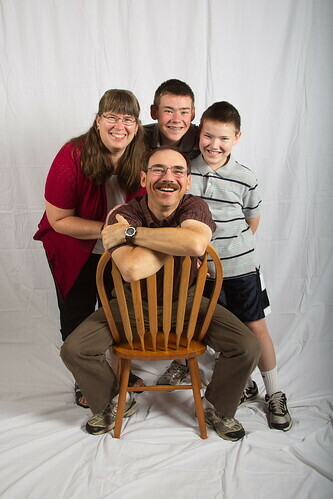 While the lights and backdrop were set up, we of course wanted to get a family portrait, too. We experimented with lots of different poses: one sitting, the other standing, then reversed; lined up, clustered, standing and kneeling; all the poses we could think of. I came up with this idea on the spur of the moment, and we all like it the best! It captures a sense of spontaneity and playfulness that we like very much.